When you think of hemp, do you think dope or rope? Unfortunately, there’s a lot of confusion over Hemp’s true identity. Is it just marijuana operating under s pseudonym? The answer is no, hemp is not just a pseudonym for marijuana. While both are part of the Cannabis family, hemp is completely different from marijuana in its function, cultivation and application. Hemp is used in variety of other applications that marijuana couldn’t possibly be used in. These include healthy dietary supplements, skin products, clothing, and accessories. Overall, hemp is known to have over 25,000 possible applications. In other words, if you’re looking to get high – then look elsewhere. Hemp protein powder will not get you high. It is an excellence source of hard to get nutrients along with essential dietary fiber. Hemp protein powder differs from many other protein powders because it is a whole food. It is made by grinding the whole hemp seed and will have a slightly green cast to it which means that the alkalizing chlorophyll is intact. Hemp powder is an excellent source of plant protein. It contains a complete amino acid profile plus the anti-inflammatory omega fats. Both of these help to speed recovery of any soft tissue damage that is caused by exercise. The carbohydrate content of hemp protein powder will vary according to the specific brand used and processing method of the company. As I’m sure you already know, all carbohydrates are not created equally. For example, cold pressed Nutiva Organic Hemp Protein provides 9 grams of carbohydrates and 8 grams of fiber and only 1 gram of sugar. It’s cold pressed which means no additional heat or oxygen is used in the processing of the product. Cold pressed means that no nutrients are lost in the heat of traditional processing and pasteurization. Compare that carbohydrate profile with Navitas Organics Hemp Powder has 11 grams of carbohydrates with 7 grams of fiber and only 1 gram of naturally occurring sugar. Typically all hemp protein powders contain 1 g or less of the carbohydrate content is from natural sugars. Hemp protein powder’s high fiber content may help to maintain proper digestive health and to stablize blood sugar level. When it comes to protein, the amount delivered by hemp protein powder varies by product. 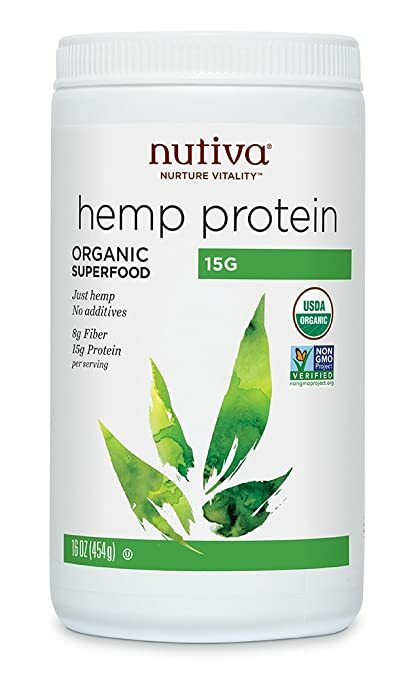 Cold pressed Nutiva Organic Hemp Protein provides 15 grams of protein. 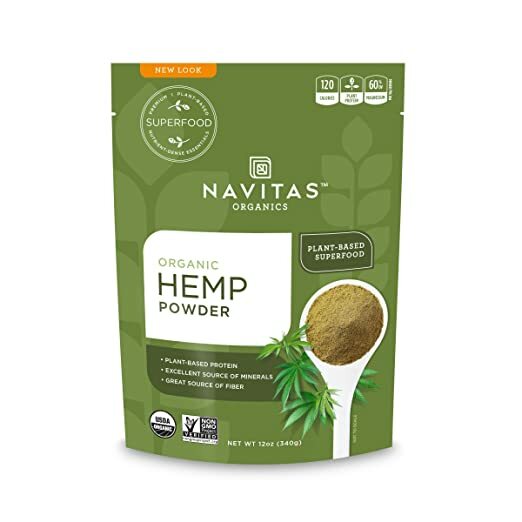 While Navitas Organics Hemp Powder provides 13 grams of protein. The protein content of hemp protein powder includes all nine of the essential amino acids, making it a complete protein. Furthermore, 65 percent of the protein in hemp protein powder is in the form of edestin. Edestin is an easily digested globulin that may offer immunity-promoting properties. The fats in hemp protein powder are healthy fats. They all provide a rich amount of essential fatty acids and supports a healthy balance of omega-6 and omega-3 fats. This balance of omega fats may protect against heart disease, certain types of cancer and also support brain health. As a general rule, hemp protein powder is minimally processed, so it retains many of the minerals and vitamins found in the original hemp seed source. Cold pressed Nutiva Organic Hemp Protein provides 40% of the RDI of iron, 25% of the DRI of zinc and an incredible 60% of the RDI of magnesium. Navitas Organics Hemp Powder provides 4% of the RDI of calcium, 40% of the RDI of iron, 8% of the RDI of potassium and an incredible 60% of the RDI of magnesium. Both hemp powders provide a health boosting amount of magnesium. Magnesium deficiencies are rampant these days. 1According to Dr. Mercola, up to 80 percent of Americans are not getting enough magnesium and may be deficient. Other research shows only about 25 percent of US adults are getting the recommended daily amount of 310 to 320 milligrams (mg) for women and 400 to 420 for men. This plant protein provides a lot of nutritional benefits for anyone who wants and easy way to increase their GLA and magnesium intake.